Irma's Impact on Rutherford Co.
Hurricane Irma has bashed areas of Florida and her impacts will be felt here in Rutherford County. The National Weather Service has issued a Wind Advisory from 4pm this (Monday) evening until 7am Tuesday. They are expecting winds of 15 to 30 miles per hour with gusts up to 50 miles per hour during that time. Winds this strong may blow down a few trees or tree limbs and cause isolated power outages. Driving may also become difficult, especially for high profile vehicles. 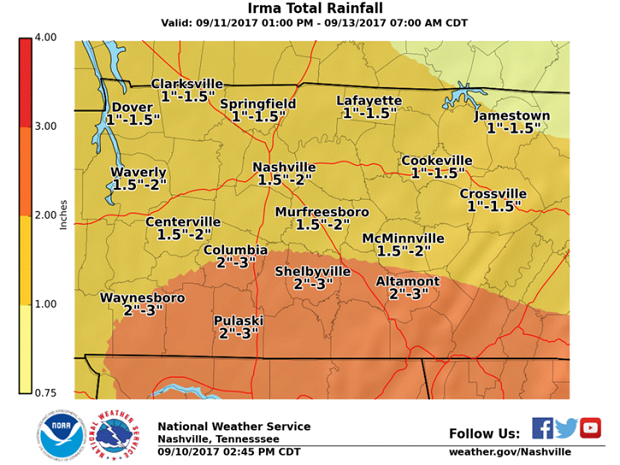 In addition, heavy rainfall can be expected as what's left of Irma pushes into Tennessee. Locally heavy rainfall, mainly one to three inches, is expected here in Rutherford County. There could be some locally higher amounts. The bulk of the rain will fall from this (Monday) evening through Wednesday. Severe thunderstorms and isolated tornadoes are NOT expected. In fact, while a rumble of thunder can't be ruled out, thunderstorms are not expected.